It was a day’s drive by wagon team or buggy to Columbus when the German immigrants settled southwest Franklin County in the mid-1800’s. This was too long a trip to make frequently, so the Catholics petitioned the bishop to establish a mission in the area. Using their own hands, they constructed a building on donated land about one-half mile east of Galloway. 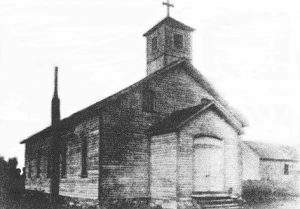 Serving a territory of approximately seventy-five square miles, St. Cecilia church was dedicated on September 3, 1882. In those early days the people gathered in the name of bingo parties, quilting bees, and chicken dinners as much to show commitment to this beginning as to raise funds and develop friendships. When this building was destroyed by fire in 1934, the people heard Mass in the Galloway town hall until they secured another site. The new church (the one in use today) was completed later that year. It was still in the country – the nearest house was about one-half mile away. The people continued to work together in pray and fellowship, cooperation and sacrifice. They built a rectory so they could have a resident pastor. Every Sunday, they brought the sisters of Mercy from Holy Family school to teach catechism. Chicken dinners and bingo parties manifested the people’s commitment to the church itself – they were the church itself! By the 1950’s the parish was changing from country to suburbia. The new settlers were young families and they put their full force of prayer and work toward building a school for their children. Smorgasbords, sales of license tags, bingo, and a thousand small projects brought this goal to fulfillment and developed the community of that era. In September 1959 school opened for the first three grades; by 1961 all eight grades were being taught. The sisters of St. Francis of Mary Immaculate formed the nucleus of the faculty. Not only were the demographics changing, but the worship and church administration were changing, also. The Parish Council was organized in 1969; the school Board in 1970. Ecumenical services and guitar services were popular. The Christ Renews His Parish program brought the people together in small groups to praise and worship God. Lay people took their places on the altar as lectors, Eucharistic ministers, and cantors. The parish had grown in numbers and needs to the point that an associate pastor was onboard. Today, St. Cecilia Parish has over 1,100 families in a thirty-one square mile territory. The schools and PSR have lay faculties. There are organizations for the youth and senior citizens. St. Vincent dePaul Society leads the parishioners in ministering to one another’s temporal needs. The Extraordinary Ministers of Holy Communion take Holy communion to the shut-ins. And virtually everyone is involved in such activities as the Parish Festival. And southwest Franklin county remains a frontier! New housing developments and apartment complexes are expected to bring even more worshipers to the already full church. As this generation of settlers is incorporated into St. Cecilia Parish, who can know what good things God has in store for them, or how His glories will be shown? !